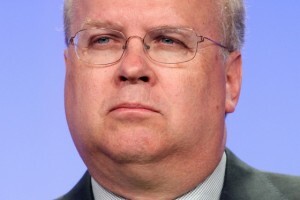 You know the GOP has become unhinged when ultra-conservative strategist Karl Rove has become the voice of reason. He has started a ruckus by founding a new organization, Conservative Victory Project, that plans to raise money to crush Tea Party extremists in the primaries, so more electable mainstream Republicans can emerge to face Democrats in general elections. Lovely sentiment coming from a doctor who sits on an important committee that is supposed lead America into the future. Needless to say, incensed Teabagger activists are throwing tantrums and want to dump Rove overboard, because they now view him as a perfidious traitor who is trying to wrest back control of the asylum from the inmates. Yeah, that ultra-liberal Rove is practically a bong-hitting, bead-wearing hippie to the severe conservatives who now elevate the Broun’s and Akins to primary victories. The madness of the modern GOP is such, that it ran moderate Sen. Olympia Snowe (R-ME) out of office and turned former Florida Gov. Charlie Christ into an Independent/Democrat. The problem Rove faces is that he seems to only want to place a thin layer of concealer on the face of the Republican Party, when it really needs a substantial facelift, and maybe even an entire new head. Simply electing candidates who are shrewd enough to mask their extremism will only go so far at a time when many voters have finally figured out that the GOP does not represent their interests. If his goal is to reform the GOP and drag it into the 21st Century, he needs to reform the party from top to bottom, not simply add cosmetic changes that are doomed to fail when up against the righteous fervor of Tea Party activists.